Sally Blanche Eggleston had spent her early childhood near Beckham Church where her father, George King Eggleston, farmed. In 1900, as a little girl of about 6 years she asked him where she came from. He told her he found her floating down Leatherwood Creek in a little basket. Sounds something like the Bible story of course. When she told that story we lived near Fieldale and we had no idea where Leatherwood Creek was. Jordan Creek near Snowbird Mill we knew and sometimes on Sundays we fished in the Mayo. Only after I grew up and moved to the Chatmoss area did I realize that the creek running through the golf course once brought little Sally in a basket. I had read that the creek was named for the Leatherwood shrub which grew along its banks. 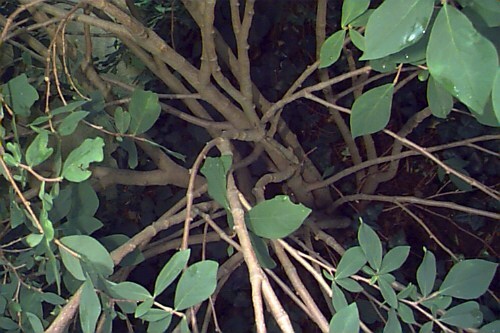 A search for information about that shrub has been ongoing with me for about 30 years. First I asked Dr. Sherman Dutton about the plant itself. Dutton was president of Patrick Henry College early on and had a reputation for knowing local flora. 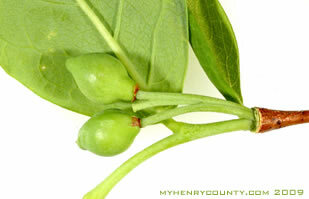 He described Leatherwood as a small shrub with a short stemmed rounded leaf. Nothing like that was forthcoming but maybe I was looking in the wrong place. In this site's photo archive there are some references to it. "William Thomasson purchased 100 acres on 'the branches of Leatherwood' Creek in 1793 from John Collier." William was the first Thomasson to settle in Henry County and was Sally's great, great, great grandfather. At that time there must have been many Leatherwood shrubs. So why was it named Leatherwood at all ... used for leather, tough like leather, a leather smell? The internet is a gold mine for research of any kind. In a quote summary from Journal of the American Folklore by Alexander Francis Chamberlain (editor 1901-1909) there is mention of something called Wicopy or Wickopy. "A plant growing over much of the eastern part of the United States and know to some as 'leatherwood' was called Wicopy by the early indians." In Ojibwa 'wikop' is the word applied to the 'inner bark' of the basswood and also the leatherwood. So Leatherwood derives from the shrubs' characteristics. Many other Indian plant names still survive: Chinquapin, Pipsissewa, Wankapin. Wicopy or Leatherwood was strong, tough bark, which taken in long strips, made excellent ropes after the Indian fashion. Leatherwood was also called Ropebark and Moosewood but thankfully the name Leatherwood prevailed. A story in an old area newspaper relates the legend of how the community of Leatherwood in Henry County, VA came by its name. Two women were waiting near a store as a man rode up on horseback. The man was using a switch made of a flexible Leatherwood branch. He struck the ground with his switch and proclaimed the place be named "Leatherwood" from that day forward. The ladies were glad he didn't name it Moosewood.